Columbia County is a county located in the U.S. state of Georgia. As of 2000, the population was 89,288. The 2009 Census Estimate shows a population of 112,958. The county seat is Appling, Georgia. Appling is an unincorporated area, making Columbia one of only three counties in Georgia to have an unincorporated county seat. As of the census of 2009, there are 112,958 people, 31,120 households, and 25,362 families residing in the county. The population density was 119/km (308/mi). There were 33,321 housing units at an average density of 44/km (115/mi). The racial makeup of the county was 78.8% White, 15.5% Black or African American, 0.3% Native American, 3.5% Asian (0.6% of the Asians are of South Asian descent), 0.1% Pacific Islander, 1.6% from other races, and 1.8% from two or more races. 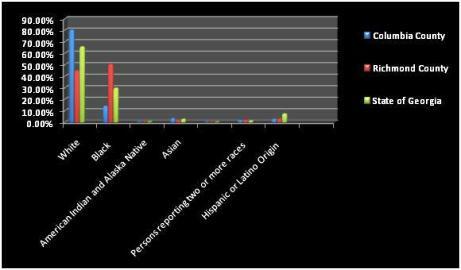 3.6% of the population were Hispanic or Latino of any race. There were 31,120 households out of which 44.40% had children under the age of 18 living with them, 67.50% were married couples living together, 10.60% had a female householder with no husband present, and 18.50% were non-families. 15.40% of all households were made up of individuals and 5.10% had someone living alone who was 65 years of age or older. The average household size was 2.85 and the average family size was 3.18. In the county the population was spread out with 29.60% under the age of 18, 7.30% from 18 to 24, 31.00% from 25 to 44, 24.10% from 45 to 64, and 8.00% who were 65 years of age or older. The median age was 35 years. For every 100 females there were 95.60 males. For every 100 females age 18 and over, there were 91.70 males. The median income for a household in the county was $65,507, and the median income for a family was $72,891. Males had a median income of $45,577 versus $28,190 for females. The per capita income for the county was $24,578. About 4.20% of families and 5.10% of the population were below the poverty line, including 5.60% of those under age 18 and 8.10% of those age 65 or over. Columbia County was formed by an act of the Legislature of Georgia on December 10, 1790; it was formed from part of Richmond County (which was one of Georgia's original seven counties; St. Paul's Parish became Richmond County in 1777). 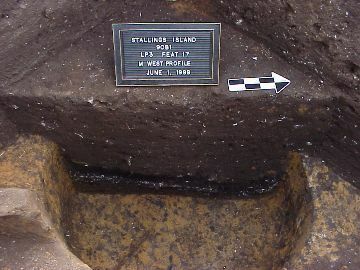 The area had been home to Creek, Euchee, and Cherokee Indians prior to colonization (one of the oldest archaeological sites in the nation can be found on Stallings Island in the County). During the Colonial era, settlement of what would become Columbia County in 1790 occurred primarily due to the presence of the second city in Georgia, Augusta. When Georgia became a Royal Colony in the 1750s and was divided into parishes, the area around Augusta became St. Paul's Parish. The primary areas of settlement were Augusta, Wrightsboro (a Quaker settlement named for the Royal Governor), and Brownsborough, which was near the present day location of North Columbia Elementary School. Brownsborough was settled by Scots, mainly from Northern Scotland and the Orkney Islands, brought over by Thomas 'Burnfoot' Brown. During the Colonial era, the Church of England was the established church in the State, and it was against the law for anyone to preach contrary to the doctrines of the Church of England. Nonetheless, Daniel Marshall established the first Baptist Church in Georgia in the year 1772 -- Kiokee Baptist Church. This church was located below Brownsboro along the Kiokee Creek in present-day Appling . Marshall was born in Connecticut and raised as a Presbyterian; he had become a Baptist and preached in the Carolinas before coming to Georgia. He was arrested thereafter. He would later serve in the militia during the war for independence. Two small battles occurred in what would become the County during the Revolutionary War between Patriot Militia and Torries; the area was then primarily still frontier and loyalties were badly divided. Legend has it that a small band of Patriots sought refuge from marauding Tories at the County's most anomalous geological feature, Heggie's Rock. One of these fights occurred on September 11th, 1781, between the forces of Elijah Clarke and a band of Torries and British Soldiers. George Walton, the Virginia-born statesman who signed the Declaration of Independence, resided in what would become Columbia County, as did William Few and Abraham Baldwin, who would later participate in the Federal Convention that framed the United States Constitution. Just before and immediately after the Revolution, large numbers of Virginians and North Carolinians settled in the parts of Georgia above Augusta, including the area around Brownsborough. After the Revolution, there arose a controversy as to whether Augusta or Brownsborough should be the County Seat of Richmond County; it was decided instead, on the insistence of William Few, that the County would be partitioned. The new County formed from Richmond was named "Columbia" in honor of Christopher Columbus; however, the separation did not end the controversy concerning where the seat of government would be located. The citizens of Columbia County turned to arguing amongst themselves. Apparently, one courthouse was built in Brownsborough, and another at Cobbham. The Courthouse at Cobbham was used; and Brownsborough in short order ceased to exist. In 1793, part of the County was taken, combined with part of Wilkes County, and formed into Warren County. Around 1799, a citizen named William Appling deeded to the county a tract of land for the purpose of building a Courthouse, since apparently the structure in Cobbham had either fallen into disrepair or burned. The tract of land was near Kiokee Creek and the Baptist Church that Daniel Marshall founded. A courthouse was constructed, and served the county until around 1808. The small town that existed around the Church and Courthouse came to be known as "Columbia Courthouse." In 1809, the Baptist congregation left the town and constructed a new meeting house several miles away (the building which is still standing) near the junction of Kiokee and Greenbrier Creeks. That same year, construction began on a new courthouse, which was completed in 1812. 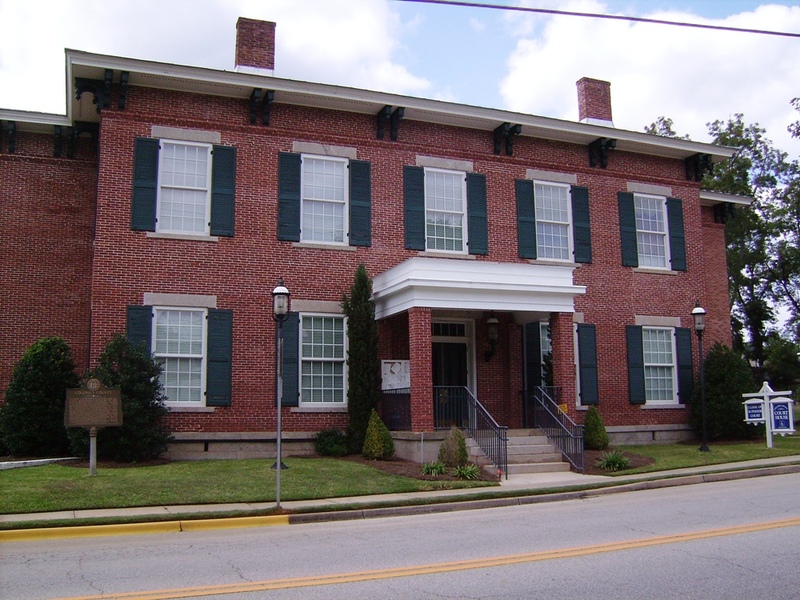 In 1816, Columbia Courthouse was charted as the Town of Appling, named for the Appling family that had donated the land to the county and for Col. John Appling, a local resident that had died in a campaign against the Seminoles. Appling was the political, educational, social, and religious center of the County. Near Appling were located Mt. Carmel Academy and Columbia Institute. Mt. Carmel Academy was run by the famous Southern educator, Moses Waddel; it was here that John C. Calhoun and William H. Crawford were educated. Columbia Institute was started by a certain gentleman pretending his last name was Bush; he was none other than the Bushnell of revolutionary war submariner fame. Additionally, during the Georgia Gold Rush of the 1820s, some successful prospecting and mining occurred in Columbia County. In the 1830s, when the Georgia Railroad was established, it was decided that to have the trains passing near Appling would disturb the proceeding of the Court, so the railway that passed through the County from Augusta went well below Appling. Also in the 1830s, when the Augusta Canal was constructed, the project required Columbia County to co-operate, since the beginning of the canal and the locks were to be in Columbia County. 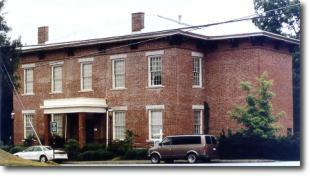 In 1855, the Courthouse in Appling received a major overhaul, and after the remodeling was complete, the building was in more or less its present form; apparently, despite the extensive project, the shell of the 1809-1812 building was retained. Plantation agriculture was the prevailing way of life in the County prior to the American Civil War, and a number of vast plantations existed, the central houses of some of which still exist. There were times when the slave population outnumbered the free white population. When Georgia seceded from the Union, it was a native son of Columbia County that presided over the Secession Convention, George Walker Crawford, who had previously been the only Whig governor of the State. Men from the County served in several companies, amongst them being the Hamilton Rangers and the Ramsey Guards, some in the 48th Georgia Volunteer Infantry Regiment, and some in the 22nd; almost all in Wright's Brigade. The troops assembled in front of the Courthouse, then went and boarded trains at the depots then in existence in the County (Berzelia, Sawdust, Dearing, Thomson). No actual fighting occurred in the County during the war; nor was it directly in General Sherman's path. However, according to some family stories, some Union Cavalry scouts or bummers did enter the county. Near the war's end, the remnants of the Confederate treasury were taken through Columbia County from Augusta to where the Chennault Raid occurred in neighboring Lincoln County. The war took a heavy toll on the white male population of the county; a plaque behind the bench in the main Courtroom bears the names of Columbia County's Confederate dead. During Reconstruction, the County was subject to military occupation, it being attached to a special district including Warren, Wilkes, and Oglethorpe Counties that additional Union forces were sent to due to considerable Klan violence reported by the Freedman's Bureau (whose reports also detail a mob lynching which occurred in Appling in July of 1866). The controversy over the location of the courthouse reared its head again due to railroad related growth in the town of Thomson. In 1870, part of Columbia County (including Thomson, Dearing, and Wrightsboro) was combined with part of Warren County to form McDuffie County, which was named after South Carolina Senator George McDuffie. Thomson was made county seat of the new county. Appling was nearly wiped off the map by a tornado in the 1870s, and for all intents and purposes, it never regained the prestige it had prior to the tornado and the War Between the States. 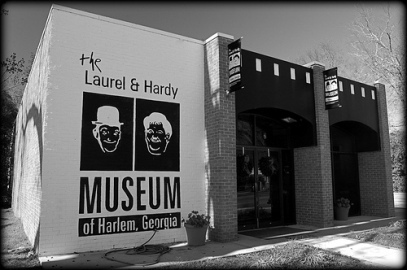 The remainder of the 19th century saw the development of the county school system, and the birth of the Cities of Harlem and Grovetown. Harlem began in the 1880s when a disgruntled railroad employee by the name of Hicks, angered by saloons and sabaath breaking in Sawdust, moved along the tracks one mile east and set up a rival town, complete with its own depot. Sawdust eventually was more or less eclipsed by Harlem, losing its depot and being absorbed by Harlem in the 1920s. The City was named after Harlem, New York. Grovetown, named for Grove Baptist Church, began as a resort town for wealthy Augustans to get away to; it had its genesis also in the 1880s. Also, a strange incident concerning a religious cult camping along Steiner Creek occurred during this era. The twentieth century saw drastic change in the County. In 1917, Harlem was badly damaged by fire. Additionally, the process of bringing electricity to the County began. Men from Columbia County answered the call of duty and served bravely in both World Wars. Prior to World War II, the County was still almost completely agricultural--cotton was still king. Camp (later Fort) Gordon was established, absorbing for the United States Army a large portion of Richmond County and parts of Columbia, McDuffie, and Jefferson; when this installation was kept following the war, the course of history for the entire Augusta area including Columbia County was forever changed. Also, the Clark Hill Dam was constructed, and a considerable area of northern Columbia County was submerged under the new reservoir. 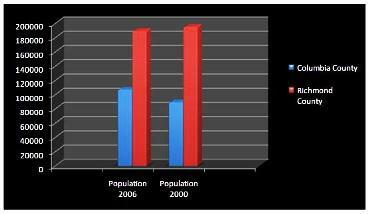 Between 1950 and 1990, the population increased dramatically. Agriculture likewise declined majorly, the County becoming largely a residential area for persons employed in Augusta. 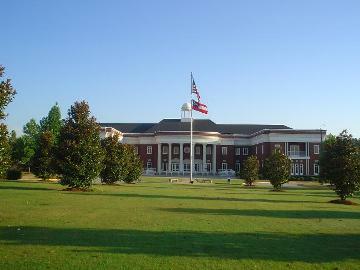 A considerable number of persons stationed at Fort Gordon eventually settled in Columbia County. The schools were integrated largely without incident under the wise leadership of Superintendent John Pierce Blanchard, and the unincorporated communities of Martinez (formerly Lulaville, named after a Cuban Doctor) and Evans (named after a Confederate General) become the population centers of the county since they were nearest to Augusta. And yet again, the location of the Courthouse and seat of government reared its head, and today, Evans is for all intents and purposes de facto county seat, being the location of an expansive new Courthouse Annex and other government offices. Appling lost its town charter in 1995 and today is a nearly dead town. Some notable persons either born in or who resided in Columbia County include: Oliver Hardy (Comedian, born in Harlem), Paul Hamilton Hayne (poet, author), Henry Louis Benning (Confederate General for whom Fort Benning is named), William Few, Abraham Baldwin, George Walton, George W. Crawford, William Harris Crawford (presidential candidate, 1820s), Populist leader and Georgia Senator Thomas Watson (born in Thomson when it was still in Columbia County), George McDuffie (Senator from South Carolina in the early 1800s), Jesse Mercer (a long-time preacher in the County for whom Mercer University is named). Bodies of Water: Clark Hill Lake (Thurmond Lake), Savannah River, Kiokee Creek, Little Kiokee Creek, Euchee Creek, Steiner Creek, Tudor Branch, Greenbrier Creek, Boggy Gut Creek, Cobb Creek, Crawford Creek, Reed Creek. Geological formations: Heggie's Rock, Burks Mountain, Mount Carmel. Historic sites: Courthouse and Jail, Marshall Monument, and various places associated with Kiokee Baptist in Appling; Stevens Creek Dam and Canal Locks; birthplace of Oliver Hardy in Harlem; various cemeteries. For more than a decade, there have been discussions by county officials to incorporate the county into a city. This issue first became moot in 1996 when the city of Augusta and Richmond County consolidated their governments. A peculiar state law mandating three mile "buffer" zones between cities effectively halted any efforts for Columbia County to incorporate, as it was contiguous to Augusta-Richmond County. In 2005 talks of incorporating the county into a city resurfaced when the Georgia state legislature abolished the three mile "buffer" zone, thus allowing Sandy Springs in North Fulton County to become a city. Columbia County Commission Chairman, Ron Cross, led a campaign to bring the idea of county incorporation back to life. However, it was referred to as "consolidation", since counties in Georgia alone cannot incorporate, but can rather consolidate with an existing municipality within the county. The plan was to hold a referendum to incorporate Evans into a city (currently a census designated place and home to most county government offices) and then simultaneously consolidate it with Columbia County.